Azure is Microsoft's cloud solution for IoT projects. 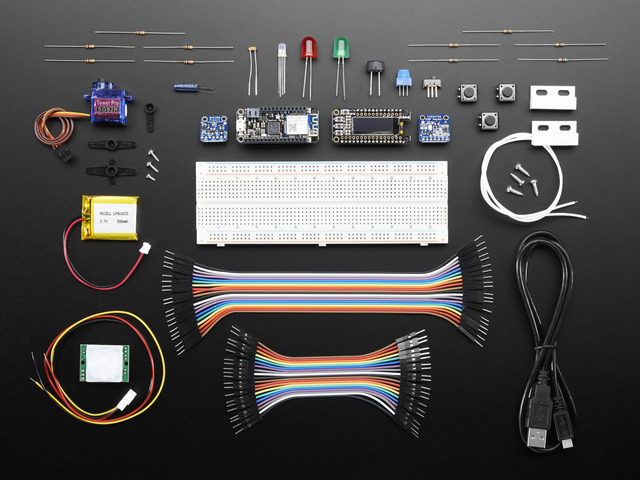 Azure is a comprehensive and flexible program from the Microsoft team that they're extending into the open source hardware world. This starter kit includes a pre-soldered Adafruit Feather M0 WiFi with stacking headers, a FeatherWing OLED, and some sensors and components to get you started on your IoT journey. The Adafruit Feather M0 WiFi with ATWINC1500 is our take on an 'all-in-one' Arduino compatible and high speed, reliable WiFi board with built in USB and battery charging. The FeatherWing OLED adds a 128x32 monochrome OLED plus 3-user buttons to the main Feather Board. Check out our tutorial here to learn how to set up your Feather M0 WiFi. For information and help setting up your FeatherWing OLED. click here. Please note: Azure is a paid IoT service, you will be charged for usage. For non-production usage, keep track of the billing & make sure that you shut off any running services if you're not using them. 1x Premium Male/Male Jumper Wires - 20 x 6"
1x Premium Male/Male Jumper Wires - 20 x 3"